The Danish Institute for International Studies (DIIS) will hold a seminar (English) in Copenhagen on 24 October 2011, 14.00-16.30. Advance registration is required. Registration deadline is Friday, 21 October 2011 at 12.00 noon. Click here for more information. 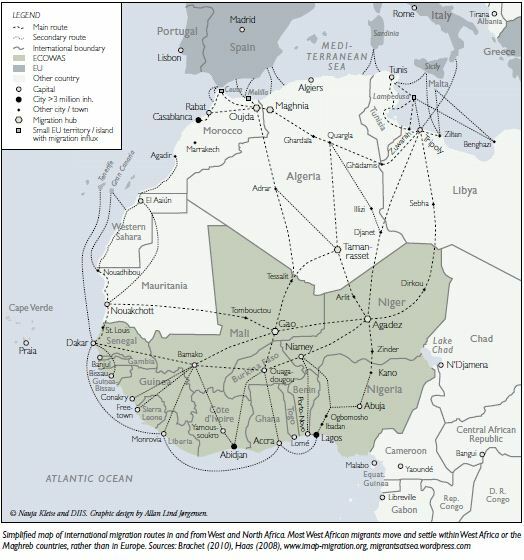 From the DIIS announcement: “Historically, migrants have regarded West Africa as a sub-region of free movement. Independence has altered the traditionally borderless migration systems, while recent political and economic crises in formerly labor-importing countries of the sub-region have led to restricted regulations on migration and a series of expulsions. The free movement of persons within the ECOWAS (Economic Community of West African States) community is an enduring achievement of the organization. Targets are set for a community passport and a single monetary zone. This seminar will look closer at the functioning of the ECOWAS secretariat in a context of wavering political support, political instability, inter-state border disputes not to mention increased pressure for migration due to two decades of economic downfall. The focus on migration will increase the understanding of the bottlenecks of an organization that during the first 25 years of existence was largely based on state-to-state relations, but where migration is transforming the traditional linguistic divide between countries that are themselves metamorphosing from immigrant-receiving to transit to migrant-sending countries. Sanoh N’Fally is the Director of Free Movement for ECOWAS under the Office of the Commissioner of Trade, Customs and Free Movement…. Cathrine Withol de Wenden is a Professor at Sciences Politiques in Paris. Her research focuses on the relationship between migration and politics, migration flows, migration policies and citizenship in Europe and in the rest of the world. She is the author of “The Borders and Boundaries of Mobility” in Antoine Pécoud & Paul de gutcheneire (eds), Migrations without Borders: A Global Perspective, (UNESCO/Berghahn, 2007) as well as Atlas of Migration in the World: Refugees or Voluntary Migrants (Autrement, 2005).